MDaemon Email Server now includes support for Microsoft's ActiveSync, which is a separately licensed over-the-air (OTA) ActiveSync (AirSync) server. ActiveSync provides synchronization of a user's default and shared email, calendar, and contact data between their MDaemon/Webmail account and an ActiveSync capable device. ActiveSync for MDaemon installs along with MDaemon but it is a separate product from MDaemon and will only run as a trial for 30 days. The trial begins when you install MDaemon and enable ActiveSync for the first time. NOTE: If you are upgrading MDaemon from an earlier version and have previously purchased an ActiveSync license, your current key will work for MDaemon 13.5. Beginning with MDaemon 14, the ActiveSync license will need to be renewed. In MDaemon, ActiveSync can be enabled via a checkbox under the Setup | Mobile Device Management | ActiveSync menu. NOTE: ActiveSync is a web-service extension and will not work if your web server (such as Webmail) is not running on port 80 (for http) and/or port 443 (for https). ActiveSync will not work on other ports. 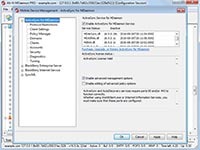 This action may wipe your existing contact and calendar data and replace it with your MDaemon data. Please keep in mind, you will be prompted before a wipe occurs. Due to this possibility, be sure you have a complete back up of your device before synchronizing the first time. You can consult your device's manual for instructions on how to back up your device. All first time syncs with ActiveSync will be a one way sync from the server to the device! After the initial syncronization, the sync will become two way. ActiveSync is a web-service extension, and will not work if your web- server (such as Webmail) is not running on port 80 (for http) and/or port 443 (for https). ActiveSync will not work on other ports. On the Android home screen, touch the Application button (the four-by-four series of squares) to bring up the list of installed applications on the phone. Press the Menu key or touch Menu (Depending on your device). In the Email Address field, enter the email address for your account. In the Password field, enter the password for your account. Domain\Username: The domain portion of your email address, followed by the username portion of your email address (example: example.com\username). Password: Enter the password for this account. Server: Make sure the hostname for the MDaemon server is listed (example: mail.example.com). Uncheck Use secure connection (SSL) unless required. Within the Email checking frequency drop-down menu, set it to desired polling interval. Note: Push is not available for MDaemon 12.5.3 and below. Verify that Notify me when email arrives, Sync calendar from this account and Sync contacts from this account are enabled (not all devices support all features). Name the account as desired (example: MDaemon Contacts).